There’s something very special about working with treasured baby clothes, children’s clothes and adult clothing, but it’s often the case that the selections of clothing that you’d like to include will be a wide variety of different types and weights of fabric. 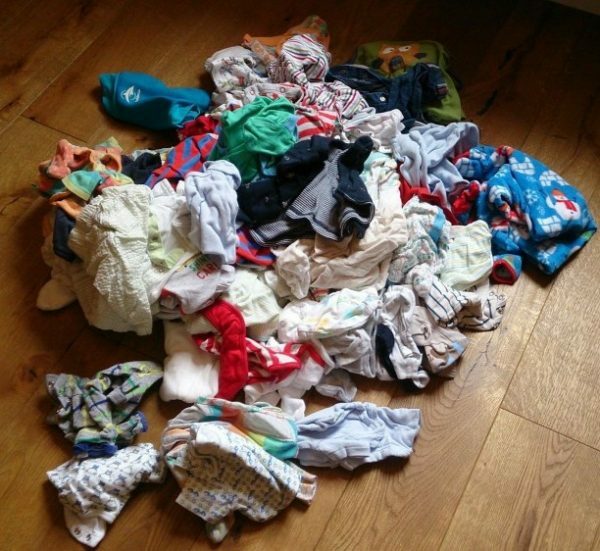 This is likely to include babygros, t-shirts and other items made from stretchy fabrics. Producing a ‘normal’ patchwork quilt will usually involve using new 100% cotton woven fabrics. This behaves! Fabric in clothing which has been fashioned into a garment, worn, washed and generally put to good use often does not behave! Add in that a Memory Quilt puts different types of non-behaving fabric together – well you get the idea…. When you try to cut patches it’s hard to keep them square. When you sew patches together your seams are wonky, the fabrics keep slipping and it just doesn’t come together as you imagined. 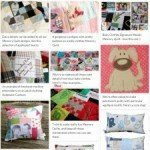 If you are making your own Memory Quilt or Keepsake Cushion you heart may sink a little as you realise that making a quilt from baby clothes might not be as straight forward as you thought. Your sewing skills are ok, but you’d welcome some extra tips too! If you’re ordering a Memory Quilt or Keepsake Cushion from us then you may be concerned about how we will make everything work together. You’re right to consider this, as making a quilt from clothes is not the same as quilting using new cotton fabrics. If tricky fabrics aren’t dealt with carefully then you’ll end up with unbalanced quilt blocks, wonky seams, puckered areas, a nasty ‘baggy’ look and a generally poor quality quilt. Although we use some of the same skills as for traditional patchwork, we’ve developed lots of experience in this specialist area. We use some specific equipment, and adopt some extra techniques too. Some clothes are really thick, and some are thin and flimsy. There’s all those motifs and special details to think of. Then to top it all off some are made from stretchy fabrics which can be really tricky to sew. Stretchy fabrics don’t always hold their shape, especially if they’ve been washed and worn, as your treasured clothing almost certainly will have been. Stretchy fabrics, well, stretch when you sew them, and can leave you with mismatched seams, and little pointy tails that you definitely don’t want in your finished quilt. Stretchy fabrics can cause your needle to jump and skip stitches, seams to pucker and lead to lots of frustration when sewing. It’s not your fault – it’s your stretchy fabrics! Stretchy fabrics may look ok for the first few patches but then you find the patchwork has twisted out of shape, and has a nasty ‘baggy’ look! We don’t want any of that in your beautiful clothing keepsakes! So, How Do We Stop Stretchy Fabrics…Stretching! There’s lots of tips and tricks that help, as well as a couple of really fundamental things that I’ll share with you below. The quilt patterns we offer (and those included in our Tutorials) have all been developed and tested over the last few years so that we know they will work well with most clothing. Different layouts often suit different types of clothing better than others, and this is all clearly described. We normally add a border made from new 100% cotton fabric to our larger quilts, which adds stability to such a large piece of patchwork. Our backings are all good quality 100% cotton fabrics, as this really helps too. 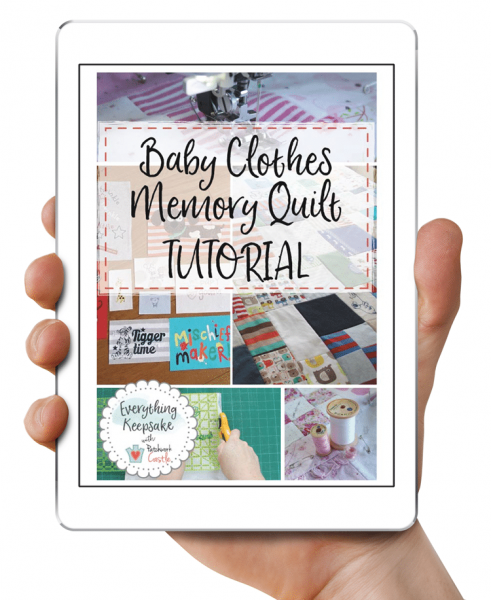 You’ll see there’s clear advice about what fabrics we can (and don’t) use in both our Adult Clothing Keepsakes Brochure (you can get a copy here) and the children’s Memory Quilts and Keepsake Cushion listings. 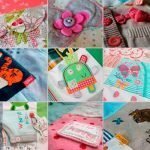 You might also like this article on choosing baby clothes for your Memory Quilt and the advice we refer customers to when they’ve placed their order on sending their clothes. The right pattern with the right clothing selection gives a great start in creating a beautiful Memory Quilt. At Patchwork Castle we stabilise all stretchy fabrics using a light to medium weight iron-on Vilene interfacing. We apply it to the back of all stretchy fabrics, knits, anything very lightweight or anything we think might benefit from it. Pretty much everything except woven cotton and denim in reality! It makes such a huge difference to the finished quality of the patchwork that it’s well worth the effort. When I first started out I thought I could get away without doing this, and sometimes I convince myself that I can skip it on occasion. I’m pretty much always wrong! It also really helps if you’re using any kind of traditional patchwork block, or want to match any seams as accurately as possible. Stabiliser is applied to the reverse of your fabric before cutting out the patch. Then sew away as normal. A walking foot normally comes as an attachment for a sewing machine. It feeds all the layers of fabric evenly through the sewing machine from the top as well as underneath. They look quite different for different models. A quick Google search will bring up lots of pictures if you are not familiar with them, but here’s an example in use. 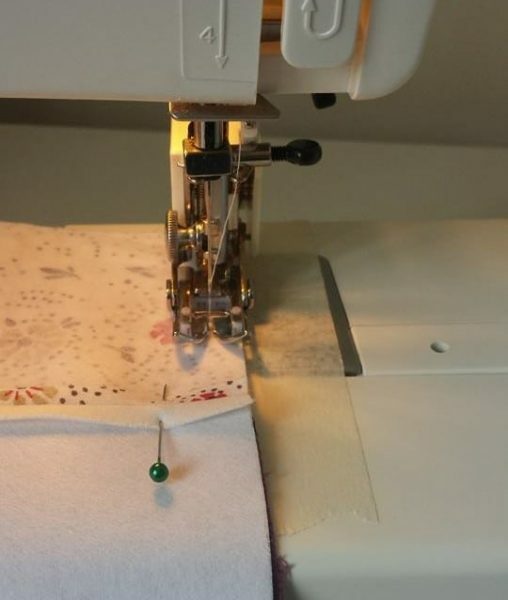 They are designed for sewing multiple layers of fabric together and particularly for machine quilting patchwork, wadding and backing together. They are also really, really useful when piecing together thicker fabrics, fabrics of slightly different thicknesses, and stretchy baby-grows and t-shirts. They help us get nice even seams and minimise stretching and puckering. This means giving thought to which fabric is used in each patch, so that we create not only a great look and colour balance, but also spread out the tricky fabrics amongst woven ones to give more stability to the patchwork. 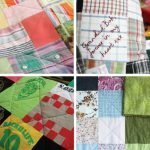 Making Your Own Memory Quilt? 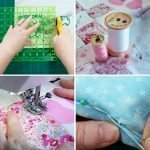 For those of you making your own, we cover how to deal with stretchy and other tricky fabrics in loads of detail in our ‘Make Your Own Memory Quilt’ Tutorial. It’s a complete guide to making your own quilt from those precious baby or children’s clothes. A comprehensive tutorial, patterns and support are included. You’ll learn loads more about how to deal with tricky fabrics, and create a beautiful keepsake quilt with love in every stitch! See loads more information here or check out our free Memory Quilting Resource Guide! If you’ve already had a go at making a memory quilt from baby clothes I’d love to hear how you find working with stretchy or difficult fabrics? Do you use interfacing and/or a walking foot? Or do you have another approach that you find helpful? 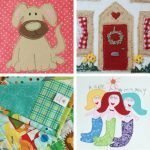 Looking To Commission A Memory Quilt? Here at Patchwork Castle we can transform your keepsake clothing into gorgeous, high quality Memory Quilts, T-shirt Quilts, Memorial Quilts, Baby Clothes Quilts and Keepsake Cushions. Please use the links below to find out more. Have you items you’d like using but concerned about how that would work? Is there anything else you’d like advice about? Then please get in touch – very happy to help. Please do leave a comment below or contact us with any questions? I’d love to hear your thoughts. Found this post useful? Know someone else who might? Then please do share it (you can use the links below!). And don’t forget to sign up below to be the first to hear about more articles like this.